Ten persons were killed and six others were injured in a road mishap on the Delhi-Jaipur National Highway No.8 near Kherki Daula village on the outskirts of Gurgaon today. At a time when the Office of the Comptroller & Auditor General (CAG) is in the spotlight for putting the 2G Spectrum allocation at the contentious figure of Rs 1.76 lakh crore, Haryana Governor Jagannath Pahadia did some plain speaking today and urged the CAG not to put “speedbreakers” in the development process. The stand-off between the Kurukshetra University Teachers Association (KUTA), which had given a deadline to the authorities to accept its demands by November 15, was resolved following an agreement arrived at between the authorities and KUTA. The Haryana Government that started the system of payment of old-age and widow pension through banks to ensure timely payment of pension has gone a step further to facilitate the pensioners by tying up with the banks to make payments on the doorstep of the payee. “The instincts of human beings not to use medicines to remain healthy make a big ground for alternatives like functional foods (useful in the prevention of various diseases) that are not only a source of energy but also have health benefits,” said Director-General, ICMR, and Secretary, Department of Health Research, Dr VM Katoch today said. In a landmark judgment that can prove a deterrent for the organised corruption of which public works departments are often accused, the Additional District and Sessions Judge, Dr Neelima Shangla, today sentenced a Subdivisional Officer (SDO), a junior engineer (JE) and a contractor to five years’ rigorous imprisonment and fined them Rs 50,000 each for misappropriation of government funds. Problems regarding paddy export in the district seem to be harassing farmers continuously and forcing them to go for distress sale of the crop as the rates of procurement of all basmati varieties have plunged almost up to 50 per cent this season. The rates of the best selling Pusa-1121 variety have slipped more than 100 per cent in comparison to the rates it fetched in 2009-10. The farmers have opted to hold the produce resulting in lower procurement of the crop in comparison to last year. The Election Commission of India has appointed VJ Bhonsle, a Maharashtra-cadre IAS officer, as election observer for Ratia. District Election Officer ML Kaushik said complaints regarding violation of the model code of conduct could be made to Bhonsle on his mobile numbers 09552526722 and 08295686691. Chief Minister Bhupinder Singh Hooda has sought Israeli help and technology for setting up more centres of excellence and saline water technology and sewage water treatment projects in the state. “There is absolutely no evidence that pesticides are responsible for cancer in India, especially in the Malwa region of Punjab, Director-General, ICMR, and Secretary, Department of Health Research, Dr VM Katoch today said. According to the available information, driver of a truck had parked it on the roadside. Fourteen labourers were sleeping in the truck, which was also carrying iron girders. Meanwhile, driver of another truck coming from Jaipur side lost control over the vehicle and it rammed into the parked truck from the rear. 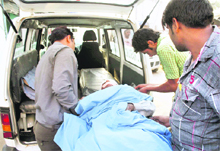 The iron girders loaded in the truck fell on the sleeping labourers, eight of whom were killed and six injured. The hapless labourers are said to be sandwiched between the iron girders and some other construction material, which was being carried in the truck. The driver and cleaner of the other truck, which hit the parked truck were also killed. According to preliminary investigations, the bursting of a tyre of the speeding truck seems to be the reason behind the mishap. The injured persons were rushed to a hospital, where the condition of four is stated to be critical. The police has registered a case and further investigations are on. Speaking at a function to mark the closing ceremony of the completion of 150 years of the CAG organised by the Office of the Principal Accountant-General, Haryana, Pahadia asserted that CAG should ensure accountability in public life by highlighting those acts of omission and commission of the legislature and the executive “which were necessary”. He, however, asserted that CAG was doing a yeoman’s service in ensuring accountability in a democratic set-up and had played a significant role in the emergence of India as the super power. Terming CAG as the main pillar of ensuring transparency in public life, the Governor said the institution had played a major role in the strengthening of Indian democracy over the years. Onkar Nath, Principal Accountant-General (Audit), gave an overview of the performance of the accounts and entitlement offices in providing prompt services to the Haryana Government employees, including maintenance of the general provident fund, loan accounts and pensionary benefits. Saying that the Haryana office of CAG had a mammoth job as it was maintaining about 2.25 lakh general provident fund (GPF) accounts besides thousands of other routine works, loan accounts and pensionary benefits, Onkar Nath said a grievance redressal cell had been set under the direct supervision of the Principal Accountant-General. Earlier, Balvinder Singh, Principal Accountant-General(Accounts and Entitlement) highlighted the role of the supreme audit institution -- CAG -- in making India a vibrant democracy.With reforms being organised in the Indian economy and government, CAG has kept pace with changing times as far as audit and accounts methodologies were concerned, he added. “The university has accepted most of the demands at a meeting with representatives of KUTA held here on November 11 and a number of issues relating to implementation of the revised Sixth Pay Commission recommendations and scales stand settled,” a spokesman of KUTA said. While some of the demands were already at the implementation stage, others would be implemented very soon, the KU spokesperson said, adding that the demand for grant of advance increments to PhD, MPhil and MTech scholars has been resolved and its implementation was under process. The cases of benefit of past service of teachers are being processed and the cases of teachers who have become due for senior scale and selection grade up to July 20, 2011, will be governed according to old procedure. Lecturer selection grade/Reader on completion of three years of service up to July 20, 2011, would be re-designated as Associate Professor without API procedures and Lecturer selection/Reader promoted before the above-mentioned date would also be designated as Associate Professor on completion of three years’ service without API scores. The promotion cases of Associate Professors who become due for promotion as Professors on or after July 21, 2011, will be processed accrding to clause 9 of the guidelines issued by the state government, the spokesperson added. Further, the Readers who opt to become Professors under Career Advancement Scheme and have completed eight years of service as Reader before September 1, 2009, will be designated Professors according to the old scheme. The issues pertaining to professorship in University College and five-day week for teachers of the university are being taken up with the state government, he said. Under the new scheme, the pension will be deposited in the account of the pensioner before the 10th of every month and the representatives of the bank will go to the village themselves and distribute the amount on the doorstep of the pensioner. The bank will also pay interest on the amount kept in the bank and a Customer Service Centre will be opened for every 700 pensioners where a representative will be present on all working days except Sundays and holidays, District Social Welfare Officer Baljit Singh said. He said applications had been invited for registering new beneficiaries under the pension scheme and urged all eligible persons to submit their applications by November 30. Persons above the age of 60 years and with an annual income below Rs 50,000 are eligible for pension, he added. The applications along with birth certificates, ration cards or voter cards will be received in the office of the Block Development and Panchayat officer concerned. The trio were accused to have siphoned off government funds to the tune of Rs 7,67,469 by tendering a bogus and fabricated bill for the construction of a road in 2005. Sanjay Sharma, a contractor, had taken the contract of a road from Dabwali Chautala to Dhani Sikhan. He, allegedly in collusion with the SDO PWD (B&R), Sirsa, Surat Singh, and JE Purshotam Kumar, constructed the road by using 20 per cent less bitumen and 15 per cent less premixed carpet than the specified norms. On a complaint, it was found that the condition of the road was so bad that a pit could be dug on it with the help of a small light stick. Upon inquiry, the then Deputy Commissioner found the allegations correct and Sharma deposited the misappropriated funds of Rs 7,67,469 with the state exchequer. The judge, Dr Neelima Shangla, found the trio guilty of offences under Sections 13(1)(c) and 13(1)(d)(ii) of the Prevention of Corruption Act and Sections 218 and 120-B of the IPC. The accused shall have to undergo a further imprisonment of one year each on their failure to pay the fine. Though the total procurement of paddy in the mandis of the district has gone up to over two lakh metric tonnes till last evening, the purchase of the crop especially the basmati varieties has been reported to be slow due to lower procurement rates prevailing in the market. There has been poor enthusiasm among the farmers due to a sharp fall in the rates of the basmati this year, claims Sandeep Malik, a commission agent in the local grain market. Claiming that problems on the export front had brought down the rate of the leading variety of 1121 from Rs 2,400-2,500 to a range between Rs 1,300 to 1,750 this time, he said many of the farmers had started holding up the produce due to poor rates prevailing in the market and thus there had been a kind of slump in the total arrival in comparison to previous seasons. But he adds that the overall production of paddy in the district had been quite good this season. Mahavir Singh had been appointed as Bhonsle’s liaison officer and his mobile number was 09466559153. He made this request at a meeting with the Ambassador of Israel, Alon Ushpiz, who called on him here today. The Chief Minister sought Israeli assistance in setting up the Centre of Excellence for Fruits -- Mango and Persimmon -- at Ladwa, Centre of Excellence for Bee- Keeping and Pinanguan at Mewat, Centre of Excellence for Floriculture Crops, Centre of Excellence for Organic Farming in Fruits and Vegetables, Centre of Excellence for Animal Husbandry and Dairying. The projects have been proposed for the second phase of Indo-Israel Action Plan. The Israel Ambassador expressed the keenness of various Israel companies to invest in the state of Haryana. Dr Katoch, who was the chief guest at the inauguration of a four-day international conference on Functional Dairy Foods-2011 with focus on “Functional Dairy Foods: Foods Beyond Nutrition”, said, “The number of cancer patients in the Malwa region of Punjab is increasing but we cannot say that pesticides are responsible for cancer in the region as there is no evidence, study or research till date.”Relating pesticides to cancer would be incorrect, he added. He said he visited Bathinda and the adjoining areas and a joint study would be conducted by the Indian Council of Medical Research and the Indian Council of Agricultural Research to find out the reasons for cancer and to see the relation between cancer and pesticides, if any, and the role of pesticides in other diseases.